The Zenica-Doboj Canton (Bosnian: Zeničko-dobojski kanton) is one of 10 cantons of the Federation of Bosnia and Herzegovina in Bosnia and Herzegovina. The capital is Zenica. During the protests and riots in Bosnia and Herzegovina in February 2014, the entire government of the Zenica-Doboj Canton resigned. This canton is situated in the central part of Bosnia and Herzegovina. 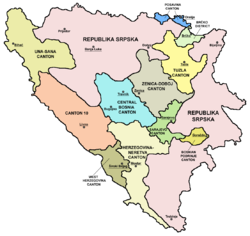 The cantonal capital is Zenica and the other town mentioned in the name is Doboj, which is in Republika Srpska, but part of the former Doboj municipality is in the Zenica-Doboj Canton. The canton has an area of 3,904 km2. 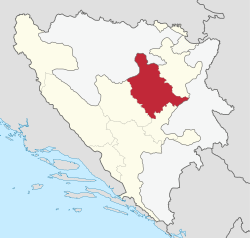 The canton is split into the municipalities of Breza, Doboj Jug, Kakanj, Maglaj, Olovo, Tešanj, Vareš, Visoko, Zavidovići, Zenica, Žepče, Usora. ^ "First release" (PDF). Federal Office of Statistics, Federation of Bosnia and Herzegovina. June 30, 2011. ^ "Government of Zenica-Doboj Canton Resigned". Sarajevo Times. 7 February 2014. Retrieved 1 April 2015. ^ "Vlada Zeničko-dobojskog kantona podnosi ostavku". RTVBN. 7 February 2014. Retrieved 1 April 2015.